What are Periodontal Stabilization Splints? Periodontal stabilization splints are used to stabilize teeth which have become loose as a result of losing the supporting bone around them to periodontal disease, a condition known as secondary occlusal trauma. Frequently the problem is complicated by heavy bite stress. Periodontal disease can destroy enough tooth supporting alveolar bone that teeth can loosen and eventually be lost. This happens more frequently with the back teeth. If the teeth have lost more than 40% of the supporting alveolar bone around them, a diagnosis of “severe” periodontal disease is made. Most often, teeth that are loose (mobile) enough to require splinting have that diagnosis. 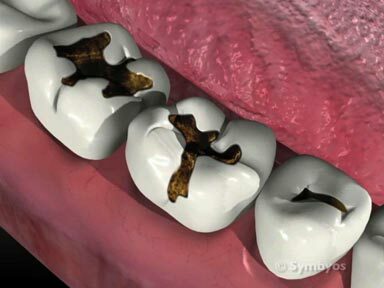 However, if the tooth roots are abnormally short or thin, or if the bone around them is not particularly dense, the teeth may be loose when less than 40% of the volume has been lost. The teeth that remain may be incapable of withstanding the increased chewing forces placed upon them. This can lead to what is called “pathologic migration,” the tipping and displacement of the remaining teeth (shown in this image), bite collapse (loss of vertical dimension of occlusion), changes in the facial contours, and even jaw joint problems. The placement of periodontal stabilization splints can significantly reduce the forces placed on the remaining periodontal attachment, and prolong the service life of the natural teeth. Your dentist can tell you if your teeth are loose enough to require periodontal stabilization splints. Another factor that comes into play is the status of the periodontal disease. If you have active disease, and the bone around the teeth is softened from inflammation, simply bringing the disease under control through other types of periodontal disease management can make the teeth less mobile. Placing periodontal stabilization splints is easy, once the teeth and gums have been thoroughly cleaned and bacterial disease process controlled. There are two basic types of periodontal stabilization splints, with some variation. Typically, an extracoronal stabilization splint does not require any tooth preparation. An extracoronal splint generally involves bonding a stabilizing wire, fiber-reinforced ribbon, or similar stabilization device, to the affected teeth such that they are all fastened together. Variations might include use of tooth-colored composite resin to “glue” the teeth together, with or without using a reinforcment wire; or placing multiple crowns, onlays, or veneers on the affected teeth, which are all fused together during the fabrication process at the lab. This type of extracoronal splinting is significantly more expensive and more difficult to do than splinting with a wire or composite resin; and may be too aggressive of treatment for teeth with significant bone loss and a questionable long-term prognosis. 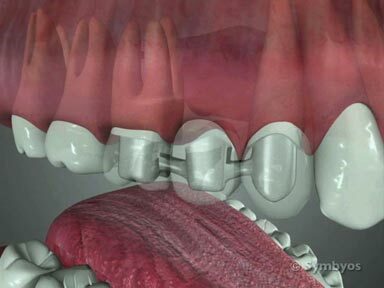 The process for placing an intracoronal splint starts by milling slots into the affected teeth. Next, a stabilizing device (commonly wire) is inserted into the slots, where it is “submerged” and is less visible, if visible at all. Composite resin filling material is typically used for bonding the wire to the teeth. An intracoronal splint is similar to an extracoronal splint, except a slot is milled into the affected teeth so that the inserted stabilizing device can be “submerged” and is less visible, if visible at all. It is common to use a wire, composite resin filling material for bonding, or conjoined inlays for the task. Using inlays may also add significant expense because they’re made in a lab. If the long-term prognosis for the affected teeth is questionable, it may also be too aggressive of treatment. 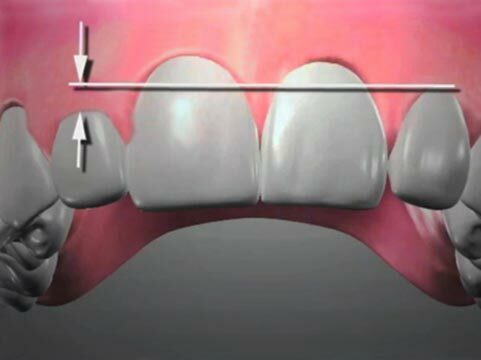 Intracoronal splinting accomplishes the same goal of immobilizing the teeth. Reducing tooth mobility makes the teeth more efficient at chewing. Splinting the teeth together reduces the forces that are placed on individual teeth, which can slow the damage to the already weakened periodontal ligaments and alveolar bone. By way of comparison, think how much easier it is to push back and forth on a single fence post and loosen it than it is to loosen that same post when it is attached to other posts as part of a fence. Stabilization splints can delay tooth loss indefinitely, while helping to spare the bone around the remaining teeth. 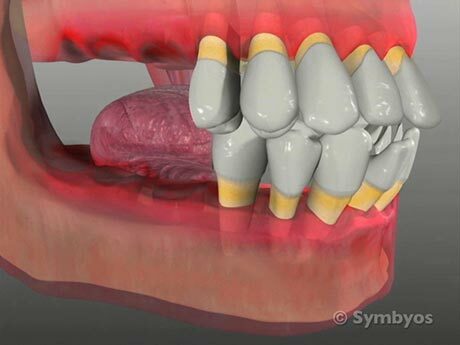 Connecting the teeth helps to prevent loss of vertical dimension of occlusion (bite collapse). Essentially, when teeth become loose, chewing forces can cause them to tip toward the cheeks or otherwise shift in the jaw (pathologic migration). When this happens, the patient’s jaws rotate closer together than normal, the chewing muscles shorten, the lower face changes shape, and the jaw joints may develop pain. Special hygiene aids may be required to adequately clean between teeth that are splinted. Periodontal stabilization splints makes the development of cavities more likely, as food collects beneath the splint attachment points that may not be easy to remove. Splints make it more difficult to clean between the teeth, at a time when keeping bacterial plaque out from between the teeth is especially important. Special hygiene aids my be required to adequately clean the teeth. Periodontal stabilization splints can be cosmetically unappealing, especially if extra-coronal splinting is done. Intra-coronal splinting generally requires cutting a slot into the teeth, whereas extra-coronal splinting generally does not. This fact may not be of great importance if the patient is faced with losing the teeth anyway. This page was last updated on February 18, 2018.